A St. Louis widow named Irma Rombauer took her life savings and self-published a book called The Joy of Cooking in 1931. Her daughter Marion tested recipes and made the illustrations, and they sold their mother-daughter project from Irma's apartment. Ethan Becker, Marion's son, led the latest version of JOY, still a family affair, into the twenty-first century with the seventy-fifth anniversary edition that draws upon the best of the past while keeping its eye on the way we cook now. It features a rediscovery of the witty, clear voices of Marion Becker and Irma Rombauer, whose first instructions to the cook were “stand facing the stove.” Recently, Ethan’s son, John Becker, and John’s wife, Megan Scott, joined the JOY team, where they oversee the brand’s website (TheJoyKitchen.com) and all social media for JOY. They spearheaded the creation of the bestselling Joy of Cooking app, available for iPhone and iPad. The 75th Anniversary edition also brings back the encyclopedic chapter Know Your Ingredients. The chapter that novices and pros alike have consulted for over thirty years has been revised, expanded, and banded, making it a book within a book. Cooking Methods shows cooks how to braise, steam, roast, sauté, and deep-fry effortlessly, while an all-new Nutrition chapter has the latest thinking on healthy eating—as well as a large dose of common sense. This is the JOY for how we live now. Knowing that most cooks are sometimes in a hurry to make a meal, the JOY now has many new dishes ready in thirty minutes or less. Slow cooker recipes have been added for the first time. This JOY shares how to save time without losing flavor by using quality convenience foods such as canned stocks and broths, beans, tomatoes, and soups, as well as a wide array of frozen ingredients. Cooking creatively with leftovers emphasizes ease and economy, and casseroles—those simple, satisfying, make-ahead, no-fuss dishes—abound. Especially important to busy households is a new section that teaches how to cook and freeze for a day and eat for a week, in an effort to eat more home-cooked meals, save money, and dine well. 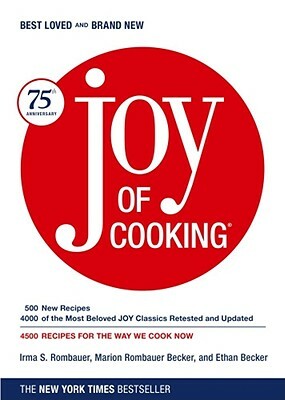 As always, JOY grows with the times: The 75th Anniversary edition of JOY boasts an expanded Vegetables chapter, including instructions on how to cook vegetables in the microwave, and an expanded baking section, Irma's passion—always considered a stand-alone bible within the JOY. This all-purpose anniversary edition of the Joy of Cooking offers endless choice for virtually every occasion, situation, and need, from a ten-minute stir-fry on a weekday night to Baby Back Ribs and Grilled Corn in the backyard, or a towering Chocolate Layer Cake with Chocolate Fudge Frosting and Homemade Vanilla Ice Cream. JOY will show you the delicious way just as it has done for countless cooks before you. The span of culinary information is breathtaking and covers everything from boiling eggs (there are two schools of thought) to showstopping, celebratory dishes such as Beef Wellington, Roast Turkey and Bread Stuffing, and Crown Roast of Pork. Happy Anniversary, JOY! Happy Cooking. Irma Rombauer self-published the first Joy of Cooking in 1931. In 1936, the first commercial edition was published by Bobbs-Merrill. Marion Rombauer Becker, Irma’s daughter, helped revise and update each subsequent edition until 1951. The 1963 edition was the first after Irma’s death and was completely Marion’s. Her son, Ethan Becker, helped Marion revise the 1975 edition, and then oversaw the 1997 and 75th Anniversary editions. Ethan’s son, John Becker and his wife, Megan Scott are the first of the family to be solely responsible for testing, revising, and updating the book since 1975, ensuring the latest edition is given the same love and attention to detail that made this culinary resource an American classic. Ethan Becker is the son of Marion Rombauer Becker and the grandson of Irma S. Rombauer, the original author of The Joy of Cooking. He attended Le Cordon Bleu in Paris, but learned how to cook from his mom. An outdoors-man, he is a master of the grill and at cooking game. His outdoor gear and survival and combat knives are sold internationally under the brand Becker Knife and Tool. Ethan and his wife, Susan, a writer, editor, and artist, live in East Tennessee at their home, Half Moon Ridge. His website is TheJoyKitchen.com. The one cookbook you’ll pass on to your children, grandchildren, nieces, nephews--basically everyone (dog-eared pages and all).